Even as the domestic two-wheeler market hit the slow lane, one segment is strongly bucking the trend and posting double-digit growth. In the last two months, moped sales have grown at an average 23 per cent, weathering the heat of demonetisation. In the November-December period, the volume of scooters and motorcycles had declined 14 and 15.8 per cent, respectively. Domestic sales of mopeds had grown by almost 27 per cent to 674,168 units during the April-December period of FY17. This is much higher compared to the corresponding growth of 16 and six per cent seen in scooters and motorcycles. Moped is the smallest segment in the two wheeler space after motorcycles and scooters. A record number of mopeds are set to be sold this year as well. Chennai-headquartered TVS Motor is the only moped manufacturer in the country and is the sole beneficiary of this surge in sales. Interestingly, TVS Motor which enjoys the third biggest spot in domestic two-wheeler market, ahead of Bajaj Auto, gets 35 per cent of its volume from mopeds. It sells more mopeds than motorcycles or scooters. The firm sold 674,168 mopeds during April-December while scooter and motorcycle sales were 643,460 and 610,438 units, respectively. In FY16, TVS sold mopeds worth Rs 1,554 crore or almost 14 per cent of the revenue. The company consistently declined responses to queries on mopeds as it eyes a bigger pie of the motorcycle and scooter market. TVS roped in superstar Amitabh Bachchan as its brand ambassador for its Jupiter range of scooters. Abdul Majeed, partner at Price Waterhouse, said South India was a key market for mopeds and it was less affected than other regions post demonetisation. “The ticket price of a moped is much lower to scooter and motorcycle. This is another reason that supports demand”. Majeed said moped was a strong segment for TVS and has helped the company expand its offerings. “There is always a market for affordable products”. TVS Motor’s third position in the domestic two- wheeler market is also owing to the presence of this additional product in its portfolio with no competition. Players like Kinetic Motors and Majestic Auto had a presence in the moped space some years ago. However, both players exited the two-wheeler space and. 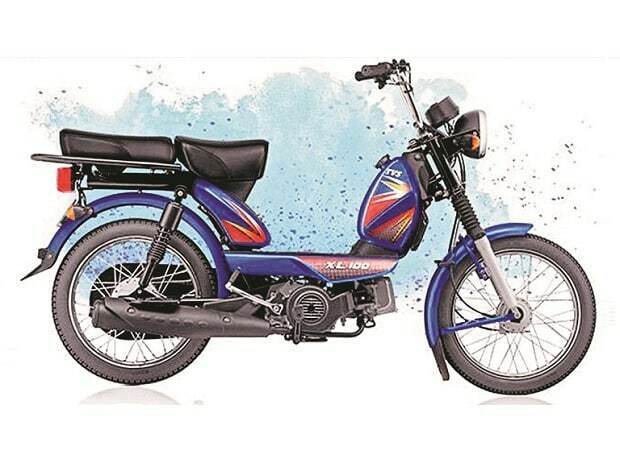 TVS manufactures four models of the moped: XL100, XL100 Comfort, XL Super and XL Super Heavy Duty. The price begins at Rs 26,857 (ex-showroom, Delhi) and ranges up to Rs 31,000. Mopeds are sought-after by people running smaller businesses due to their weight-carrying and haulage abilities. They are lighter and are easy to manoeuvre in traffic. TVS also exported 15,000 moped in the April-December period, 25 per cent more compared to last year.